Read Part 1 of this 4 part series. It’s taken most of my life to understand the structural issues that are going on in my body. I can’t remember ever speaking with a professional who explained to me what was happening in the bones and joints of my legs. It’s not such a simple thing having a toe-in gait pattern. 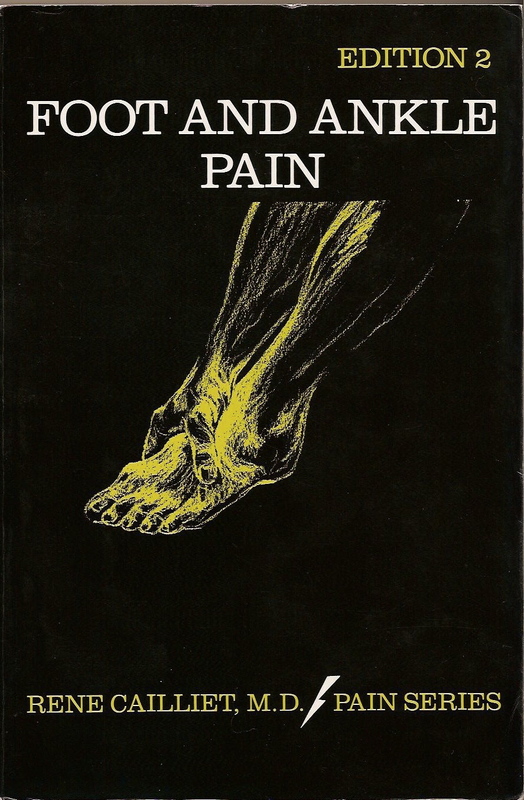 The first source I discovered that explained the pattern in more detail is an excellent little book by Rene Cailliet, MD titled Foot and Ankle Pain. In 2002, while browsing through the bookshelf of a colleague, I spotted the book and inside I found a wonderful little drawing labeled “orthotic twisters.” It was the first drawing I’d ever seen of my braces. It explained that twister cables were coiled springs within a cable housing that resists torque. Through adjustment of these springs the foot can be made to turn in or out and thus hopefully control and retrain the movements of the legs. I went on to read that intoeing can result from excessive internal rotation of the femur and/or from marked internal tibial torsion. Cailliet also stated that techniques for measuring femoral torsion presented “radiologic difficulties” and had not yet been standardized. Apparently there wouldn’t be any medical testing to answer my questions. I’d need to figure this out on my own. I sat down on the floor with my legs straight out in front of me and began to look. I noticed that when I pointed my toes straight up to the sky my right knee also pointed straight up, but my left knee pointed towards the left. I was also aware of a lot of muscular effort happening around my left hip joint. What was going on? I started to allow my left foot to rotate in. I rotated it in until the strain in my hip muscles relaxed and my kneecap pointed straight to the sky. Now my left foot was pointing towards my right. 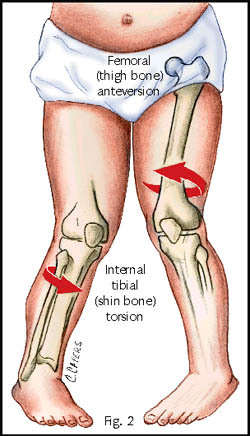 Aha, I thought, so I have an internal tibial torsion! I then started to explore the range of motion in my hips. My right leg had much more external rotation than my left; my left leg had much more internal rotation than my right. As far as I’ve been able to figure out I most likely have a femoral torsion in my left leg in addition to the tibial torsion. I also suspect there is some modeling of my actual hip joint and the associated ligaments that is congenital and some that was patterned into my body while I was growing and walking in the toe-in pattern. I believe it shaped the structure of my hip joint much like a tree can be shaped by the wind constantly blowing against it from one direction. I found some additional resources on the internet about femoral and tibial torsion that have been very helpful to me in my explorations. It is my hope that through writing about my own experience I can help others to better understand their own structural challenges. © Carole LaRochelle and Explorations On The Journey, 2008 - 2010. Unauthorized use and/or duplication of this material without express and written permission from this blog's author and/or owner is strictly prohibited. Excerpts and links may be used, provided that full and clear credit is given to Carole LaRochelle and Explorations On The Journey with appropriate and specific direction to the original content.